One week today it all begins. For many TBEX attendees it will be a first visit to Toronto while for others it’s a return and a chance to dig deeper into the city and region’s riches. For others still, Toronto is home. These bloggers are at once delegates and also hosts, elevating the visiting delegates’ experiences with their insider knowledge. Whatever distance you are travelling, as you pack those final items into your suitcases, double-check your passport and tweet your way to Toronto, here are five last-minute tips to help you make the most of your TBEX Toronto weekend. With bold architecture, public art and the most diverse population on the planet, grab your camera and shoot everything. Bring extra memory cards and batteries. Trust me. Visit any of the 250+ venues of the Contact Photography Festival on through May 31. It’s the largest photography festival in the world with more than 1,500 artists showing at free venues all across the city, including more than a dozen outdoor public installations. 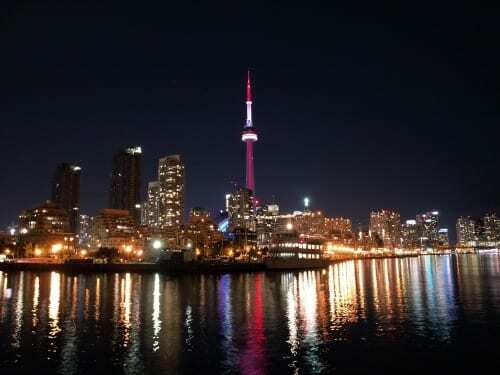 The major attractions throughout Toronto and the surrounding region are generously offering free admission to TBEX delegates not only during the conference but for several days before and after. Time is tight on these trips, so even if you can’t see it all use the pass to pop in for some high art at the Art Gallery of Ontario, Royal Ontario Museum or Gardiner Museum, or a high view from the glass floor of the CN Tower. Go hands-on at the Ontario Science Centre or focus on feet at the Bata Shoe Museum. Visit a shrine to hockey at the Hockey Hall of Fame, or a shrine one man built for his wife, the urban castle Casa Loma. Tour the city by hop-on-hop-off bus or the water by harbor cruise (which we don’t advise hopping off). More than 25 attractions are extending the offer to TBEX and we encourage you to take seize opportunity. Attendees will be receiving more information on how to take advantage of this offer (see update at bottom of this post). We’ve gotten used to the forest of cranes and construction hoarding but it’s often the first thing people notice when they visit. Sure it’s a pain to have to walk around street closures but it’s the price of living in a city with some wind in our sails and development moving at warp-speed. Toronto has more than 112 new high-rise projects (30+ stories) in development – more than any other city in the western hemisphere. Since TBEX visitors will inevitably encounter some major construction sites, here’s a handy guide to the major ones and some renderings so you can see why all the fuss will, in the end, be worthwhile. Front Street West between Yonge and University is closed to cars for the massive five-year redevelopment of Union Station – Toronto’s principal intercity rail and bus terminal and local subway hub. Crews are excavating three stories below the 100-year-old Beaux Arts building to improve the transit infrastructure and add extensive new restaurant and shopping options, a new visitor centre and a new street-level plaza, scheduled for completion in 2015, (the Visitor Information Centre opens in summer 2014. While the Queens Quay West is closed to most car traffic, just beyond the street it’s all ice cream, wave decks and cold beers on hot patios along the waterfront. The Queens Quay revitalization is remaking the street into a waterfront promenade with extensive bike and pedestrian areas. When the central business district started to run out of space, head office towers started springing up south of the railway tracks for, among others, RBC, Telus and PWC, along with new Delta Hotel, a dozen condo towers, all anchored by the Air Canada Centre and Maple Leaf Square. Also the new Ripley’s Aquarium of Canada that will open later this year and a new visitor plaza that opens up the space between the Aquarium, CN Tower and Rogers Centre. The more you explore, the more you’ll want to go even deeper. So pack an extra change of clothes and give in to that inevitable impulse to stretch your Toronto TBEX experience that little bit longer. One week to go. Pack well and we’ll see you in Toronto. Tuesday, May 28, 11:00 a.m. to 1:00 p.m. at Sheraton Centre Toronto (main lobby), 123 Queen St. W.
Wednesday May 29, 11:00 a.m. to 1:00 p.m. at Sheraton Centre Toronto (main lobby), 123 Queen St. W.
Passes are valid from May 28 through June 4. Andrew Weir is Vice President, Communications of Tourism Toronto. Follow him on Twitter at @ABWeir. Fabulous! Looking forward to putting mine to good use. A fabulous opportunity for TBEXers. Thank you Toronto tourism for extending this opportunity. Perfect for my Thursday afternoon arrival! Thank you Tourism Toronto, what a great way to start off my first TBEX. Thanks Tourism Toronto for the highlights. I was there in February when it was cold and snowy. I’m looking forward to experiencing Toronto in the Spring. The VIP Attractions Pass will make it that much easier. Thank you so much!